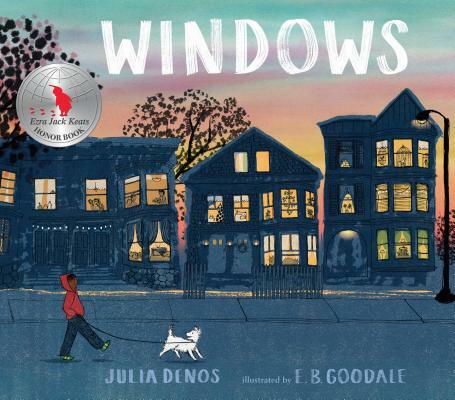 Julia Denos is the illustrator of several books for children, including Grandma’s Gloves by Cecil Castellucci and Just Being Audrey by Margaret Cardillo. She is also the author-illustrator of Swatch: The Girl Who Loved Color. Julia Denos lives in Quincy, Massachusetts. E. B. Goodale is a designer and illustrator with a strong background in stationery. This is her debut picture book. She lives in Somerville, Massachusetts. Debut illustrator Goodale's delicately detailed ink, watercolor, letterpress, and digital collage illustrations display palettes of the evening and night skies with beautifully nuanced shades of yellow, gold, and blue. The red-hooded child of color with dog can't help but recall Peter and Willie, and this book is a lovely, affirming follow-up. A warmhearted tale of a child, a dog, and their peaceful, friendly, and inviting neighborhood. Julia Denos's (Swatch) second-person text invites the reader to be an active participant in this pleasing book...E.B. Goodale brings her very own Somerville to brilliant life in her first picture book, using ink, watercolor, letterpress and digital collage. Each page is awash with the colors of dusk as the sun slowly sets until, finally, "you arrive home again, and you look at your window from the outside. Someone you love is waving at you, and you can't wait to go in."